Easter is my favorite Holiday. I love that it comes at springtime, when everything is like a renewal, the tree’s are getting their new buds, flowers start to peek out of the ground, the weather starts to turn warm, here in WI, that’s a blessing in itself. Although this year we’ve had a very mild winter, and summer like temperatures in March, I am still looking forward to spring, and Easter, the resurrection of Jesus, the promise of eternal life. In commemoration of Easter, our family started making Easter Baskets for the children at The Joy House, Cross Trainer’s Academy, and their after school tutoring program. Let me explain what each organization is, briefly. The Joy House is a Women’s Crisis Shelter, that offers a safe place to live after fleeing violence, homelessness, job lose, etc. Cross Trainer’s Academy offers a Christian education to “at risk” kids in grades K4-5th. It’s a safe, Christian environment, where after school tutoring classes help “at risk” students do well in school. All of these programs are located within the walls of the Milwaukee Rescue Mission, on 19th & Wells. 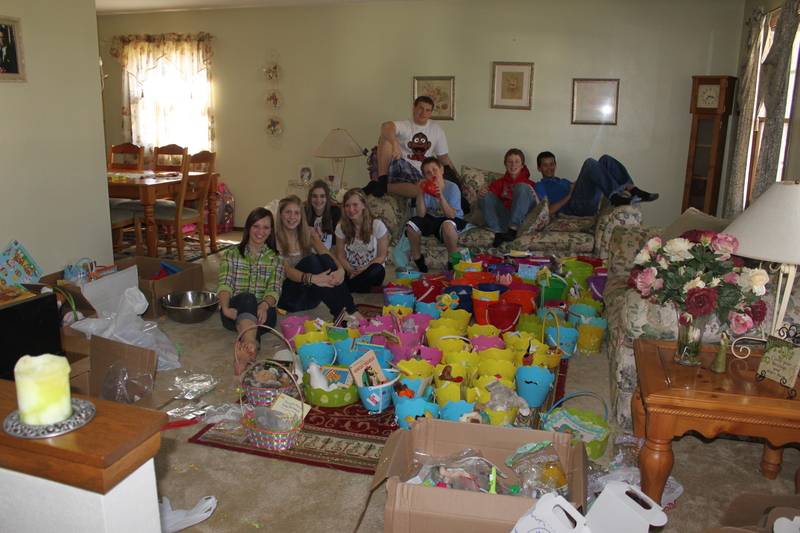 Last year we were blessed to make 200 Easter Baskets, totally possible because of donations from friends. If you would like to help, we ask for monetary donations, candy, filled candy eggs, simple items like coloring books, crayons, school supplies, books, fun little toy/gift items, stuffed animals that would fit in a basket, toiletry items like toothbrushes, nail polish, lip gloss, etc. Really anything that kids would like to find in their Easter Baskets. We never know how many baskets we will end up making, but they are all built on the foundation of Christ’s Love and with the true meaning of Easter in our hearts. If you would like to help, or have questions, please send me a comment. I’ve added a couple pictures from last year. Previous Post Guilty As Charged? Next Post Did he really just say that? What noble deeds you do.I’m curious to read your blog.You have good ideas you’re a real mom.